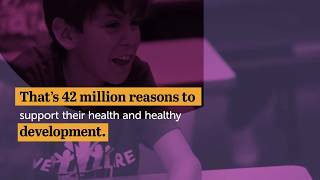 TAG: How You Can Help Video: This video briefly shows how youth-serving professionals, families, and adolescents can use the TAG framework to support adolescent health. TAG Talks Videos: In the videos below, health experts explain current topics in the adolescent health field. “Adolescent Substance Use, Addiction, and Treatment” with Sarah Bagley, M.D. “The Changing Transition to Adulthood” with Richard Settersten, Ph.D.
“The Power of the Adolescent Brain” with Frances Jensen, M.D. “The Crisis of Connection for Adolescent Boys” with Niobe Way, Ph.D.
TAG in Action Webinars: These webinars provide an in-depth look at how community organizations across the country use TAG to improve adolescent health. See one-page summaries of these webinars on the TAG in Action: Successful Strategies page. This video briefly shows how youth-serving professionals, families, and adolescents can use the TAG framework to support adolescent health. Adolescents and young adults should receive healthcare that is geared specifically to their needs, which are distinct from those of adults or young children. In this TAG Talks video, Angela Diaz, M.D., Ph.D., MPH, Director of the Mount Sinai Adolescent Health Center, shares how health professionals can take an adolescent-centered approach to providing healthcare to young people. Under Dr. Diaz’s leadership, the Center has become a leading U.S. health center focused exclusively on adolescents. The Center provides integrated, co-located healthcare services to more than 10,000 young people every year for free. It is also a major training site in the field of adolescent health and medicine, with research funded by the National Institutes of Health. Video: "Adolescent Substance Use, Addiction, and Treatment" with Sarah Bagley, M.D. In this video, Sarah Bagley, MD shares the importance of addressing substance use during adolescence and the most effective approaches to treating addiction, including opioid addiction. Dr. Bagley draws on her experience as the Medical Director of CATALYST, an addiction treatment clinic for teens and young adults at Boston Medical Center, to discuss why young adulthood is a time when many people begin experimenting with alcohol and/or drugs. Although this experimentation does not always lead to addiction, most adults who have a substance use disorder started using before age 18 and developed their disorder by age 20. Video: "The Changing Transition to Adulthood" with Richard Settersten, Ph.D. The path from adolescence to adulthood has become a complicated journey filled with uncertainty, shifting social and cultural expectations, growing social inequalities, and difficult economic choices and constraints. This video features Richard A. Settersten, Jr., Ph.D., professor of human development and family sciences and endowed director of the Hallie E. Ford Center for Healthy Children & Families at Oregon State University. Dr. Settersten is an expert on life transitions and on youth and young adulthood. In this video, Dr. Settersten examines the transition to adulthood today, how it has changed over time, what skills and capacities are helpful for youth, and the roles of families, education, and employment in the process. Video: "The Power of the Adolescent Brain" with Frances Jensen, M.D. This video reviews adolescent brain development and how it affects learning, health, and behavior. It features Frances Jensen, M.D. of the University of Pennsylvania’s Perelman School of Medicine. Drawing on clinical experience and research and inspired by her personal experience parenting two teenage boys, Dr. Jensen shares what is known about adolescent brain development, functioning, and capacity. Video: "The Crisis of Connection for Adolescent Boys" with Niobe Way, Ph.D.
NYU Professor Niobe Way explains how boys' intimate friendships in early and middle adolescence support their mental health. By late adolescence, many boys speak of losing these close male friendships and reveal feelings of loneliness and isolation. The webcast illuminates the dangers of assuming that boys don’t want or need close male friendships and the importance of fostering positive friendships that can help adolescent boys thrive. The Rales Center for the Integration of Health and Education: Beth Marshall, wellness program lead at the Rales Center, gives an overview of the program’s vision and services for youth from economically disadvantaged communities in Baltimore. The program aims to improve access to healthcare for youth by integrating health services into educational settings. Teen Health Van: Seth Ammerman, M.D., the founder and director of the Mobile Adolescent Health Services program, summarizes the program’s strengths-based approach to establishing meaningful relationships with adolescents. The program, also known as the Teen Health Van, provides comprehensive, coordinated healthcare to vulnerable youth in the San Francisco Bay Area. Wisconsin PATCH: Amy Olejniczak, the associate director of the Wisconsin-based Providers and Teens Communicating for Health Program (PATCH), describes the program’s mission and impact. PATCH is an innovative, teen-delivered educational program that aims to improve communication between healthcare providers and teens on sensitive health topics. Chicago's Action Plan for Healthy Adolescents: Suzanne Elder, former director of city of Chicago’s Office of Adolescents and School Health, reviews several citywide programs and campaigns established to address teen pregnancy prevention and other adolescent health issues. In collaboration with experts in multiple disciplines, these initiatives build upon Chicago’s evidence-based Teen Outreach Program. Bringing Health and Education Partners Together in East Baton Rouge: Sue Catchings, CEO of Health Centers in Schools, shares her experience in developing the program and its positive impact on more than 45,000 youth. The program is a multi-disciplinary collaboration among community partners that provides no-cost medical and mental health services at public school campuses. Strengthening the Steps to Success (Palm Beach County): Tammy Fields, director of the Palm Beach County Youth Services Department, shares the work of Birth to 22: United for Brighter Futures to develop a Youth Master Plan. The Birth to 22 initiative is a coalition of more than 60 youth-serving organizations working to support the healthy growth, development, and education of youth in Palm Beach County, Florida. Helping to Build Healthy School Communities Through Wellness Centers: Carolyn Camacho, program director at Identity, Inc., describes how wellness centers increase students’ access to healthcare, improve their emotional well-being, and decrease their involvement in risky behaviors. Based in Maryland, Identity Wellness Centers provide health screenings, mental health counseling, leadership trainings, after-school programs, and other services. Minnesota Plays TAG: Julie Neitzel Carr, state adolescent health coordinator at the Minnesota Department of Health, reviews the Department’s work to align priorities and planning with the TAG call to action. The Department has initiated the Minnesota Partnership for Adolescent Health, a statewide effort to engage stakeholders in the development of a new State Adolescent Health Strategic Plan. Sources of Strength: Dan Adams, director of training at Sources of Strength, speaks about this youth-serving program’s unique model and how it aligns with TAG. Sources of Strength uses a strengths-based, peer leadership approach to prevent youth suicide, bullying, violence, and substance use by enhancing protective factors associated with adolescents’ school and community-based environments. Trauma-Sensitive Schools Training Package: Kathleen Guarino, technical assistance specialist at the National Center on Safe Supportive Learning Environments, highlights tools for school administrators, teachers, and others to understand the impact of trauma on students. The New Orleans Trauma-Informed School Learning Collaborative provides support for local schools to build capacity to implement, sustain, and improve trauma-focused services. Get more adolescent health videos on our main OAH Videos page.